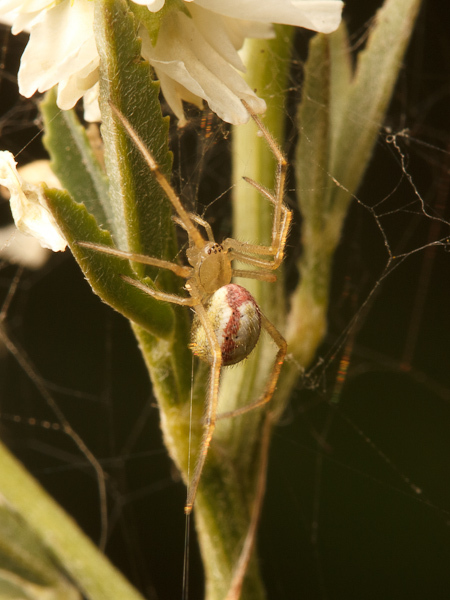 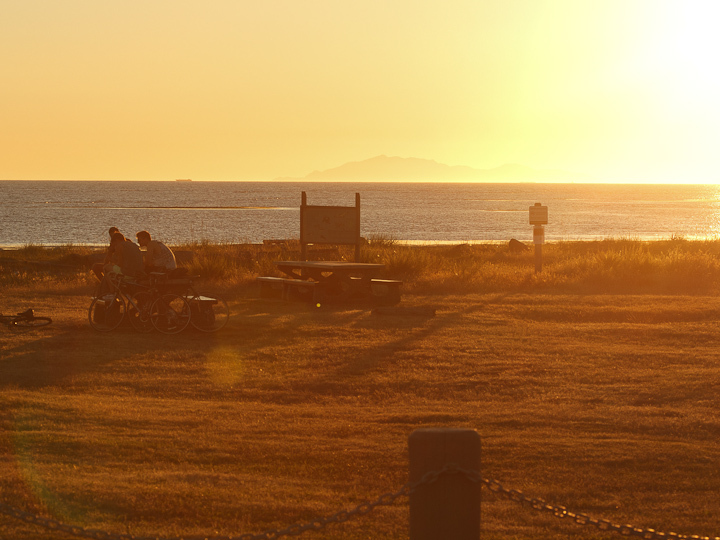 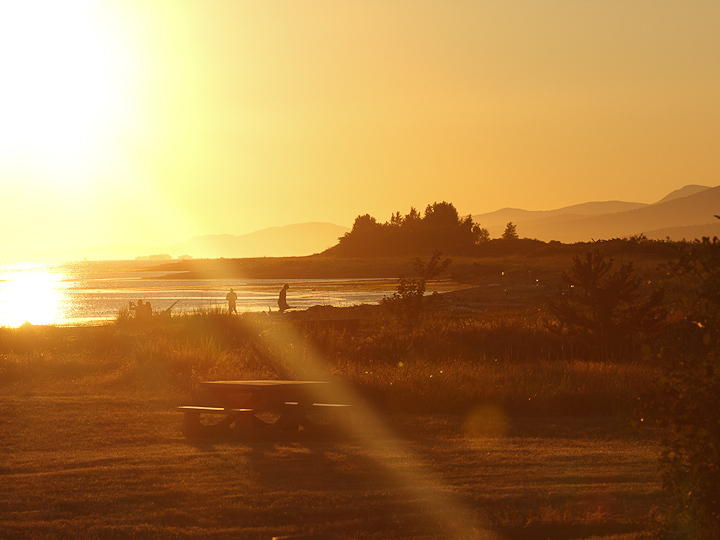 Last night, Catherine and I were out again all night, performing what was ultimately a futile spider experiment on Cordova Spit (TIXEN in the SENĆOŦEN language). 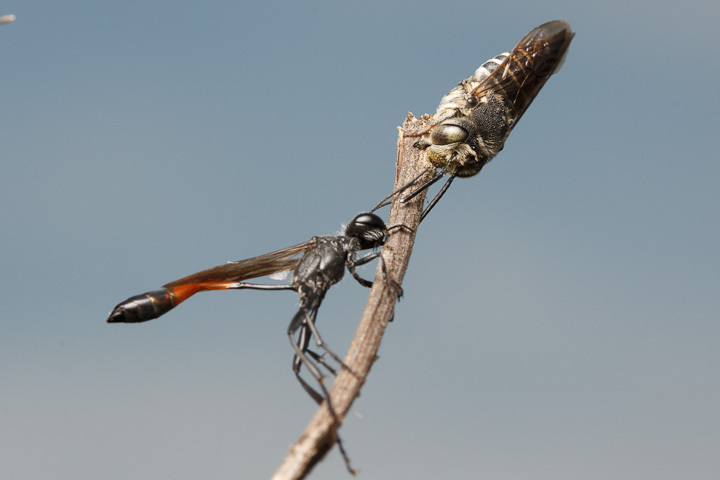 The one thing that did go right was that the dawn had some decent light, so I set out early to try to get some photos of sleeping hymenopterans. 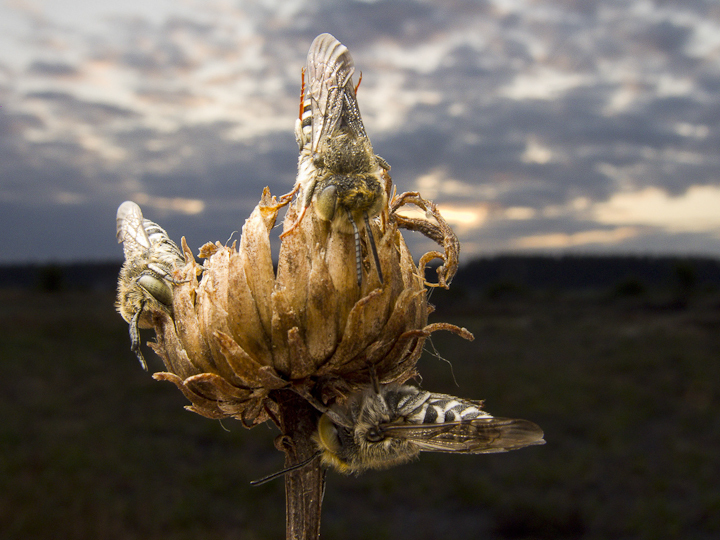 I did not end up shooting very many, as I found this absolutely lovely cluster of Coelioxys which were just begging to be shot. 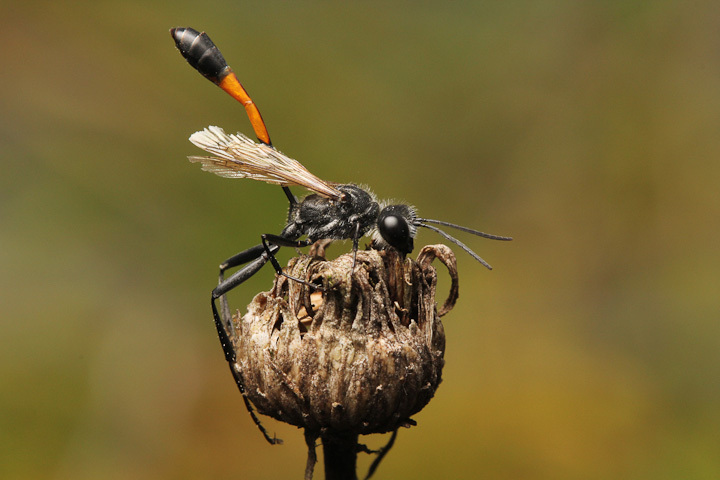 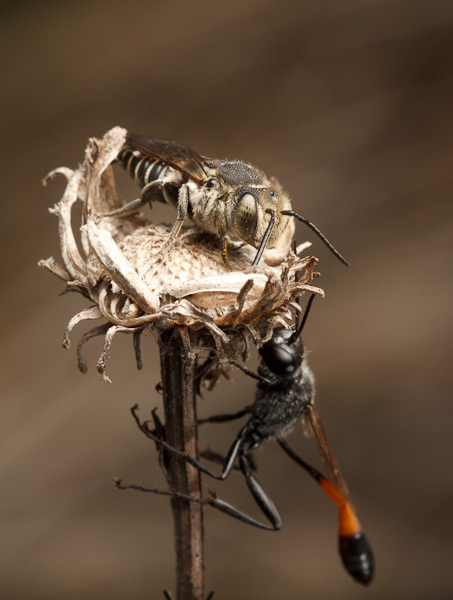 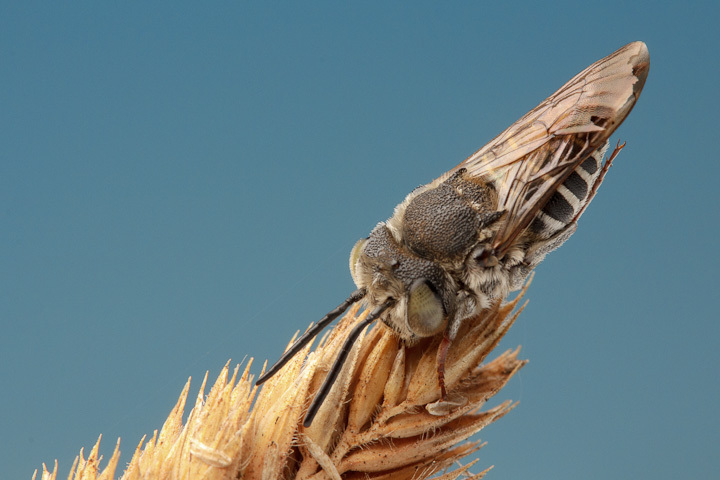 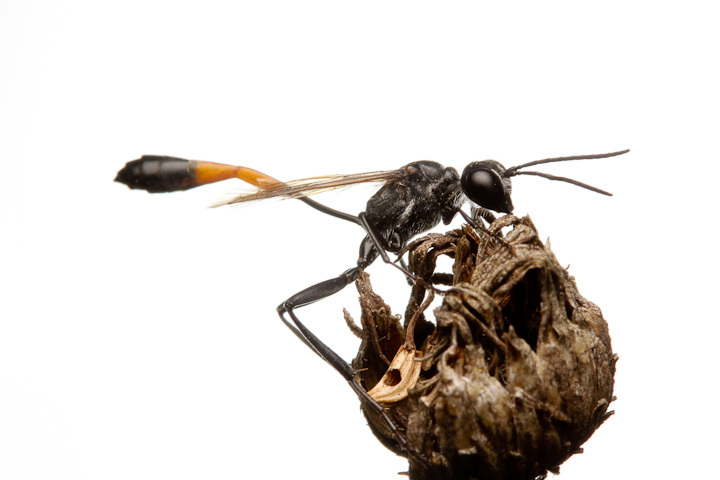 These parasitic megachilids are wonderful subjects, and seem to sleep in small aggregations, sometimes with Ammophila wasps. 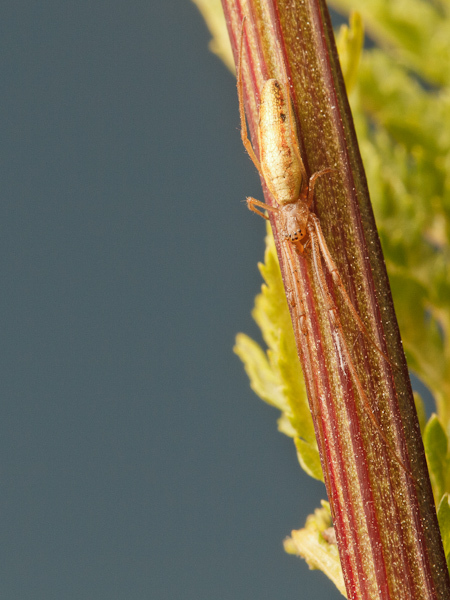 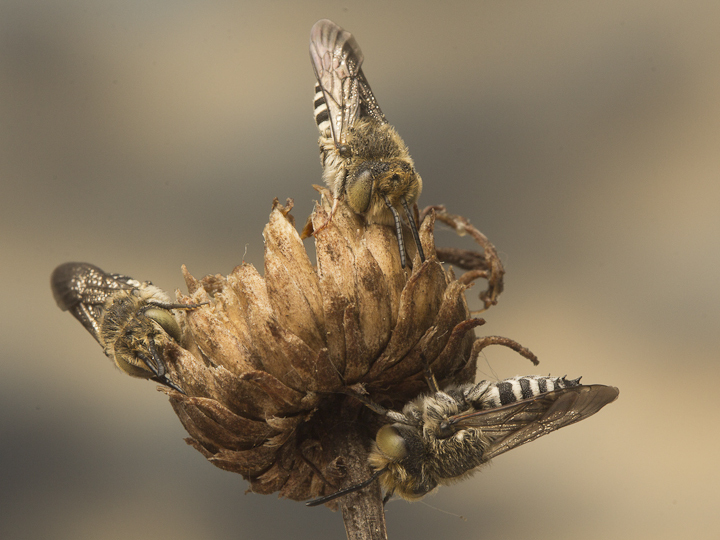 Their preferred perches are the dried seedheads of the Puget Sound Gumweed (Grindelia integrifolia), a fragrant seaside plant that is a good place to find halictids in the daytime. 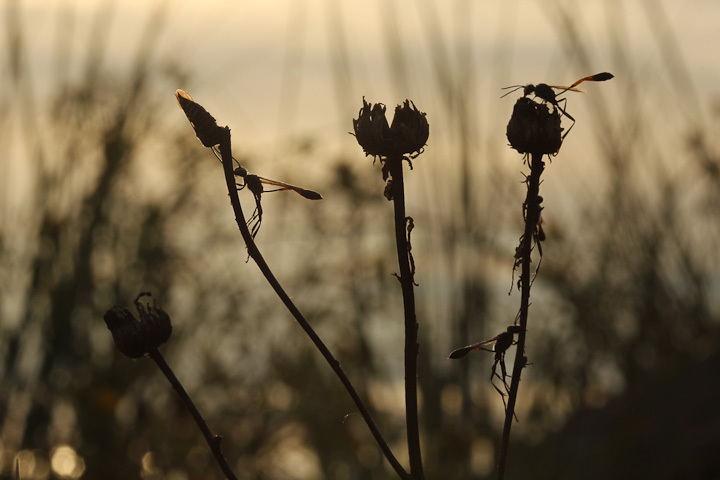 Anyway, here are some of the pictures I took this morning! 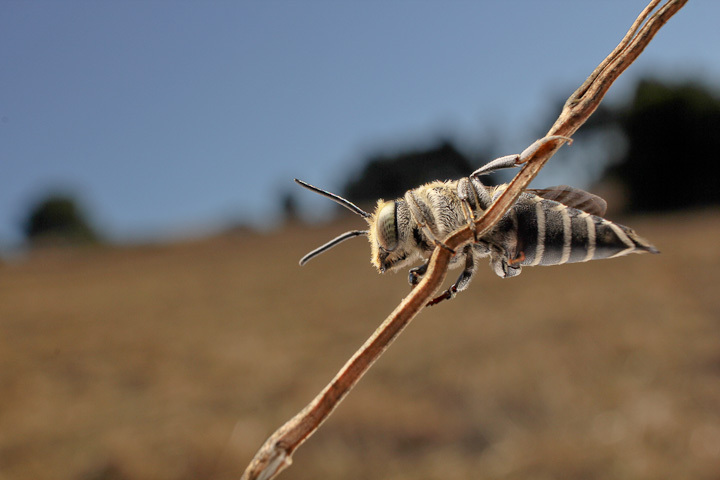 The same bees shot with the A720IS, in the wideangle macro style. 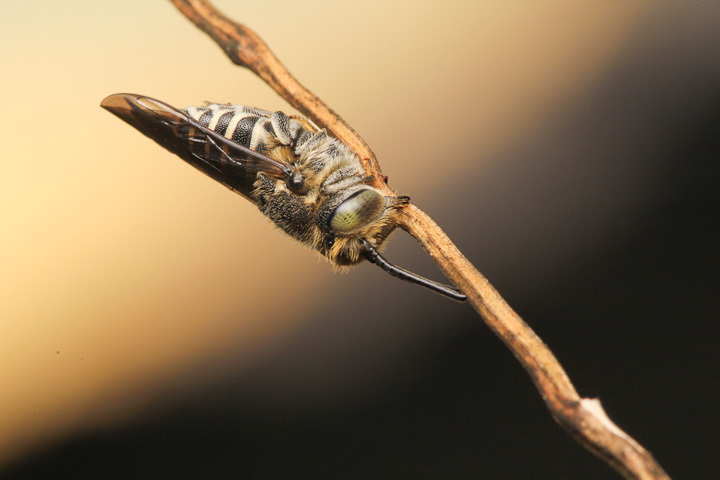 This gives the bees more of a bugeyed look! 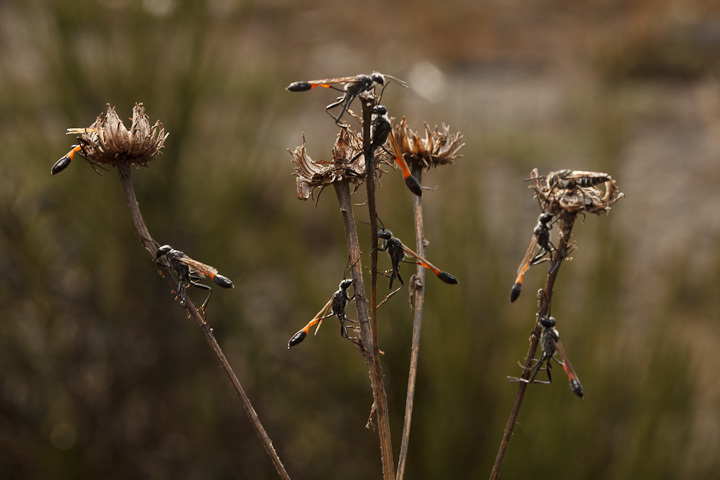 A lone Ammophila shot with the 100 mm. 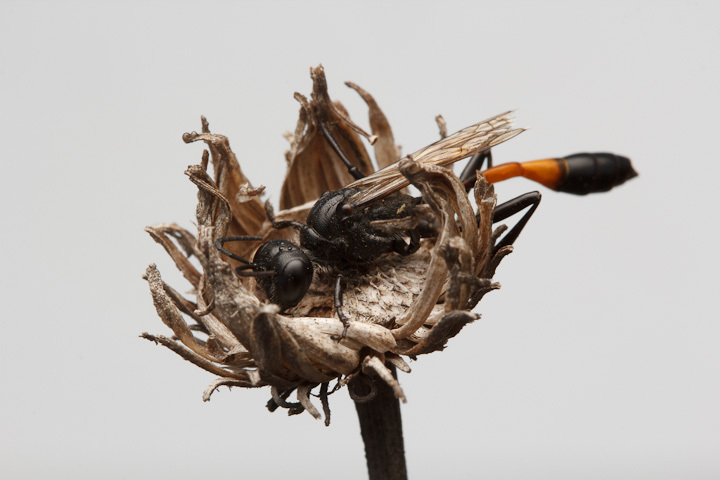 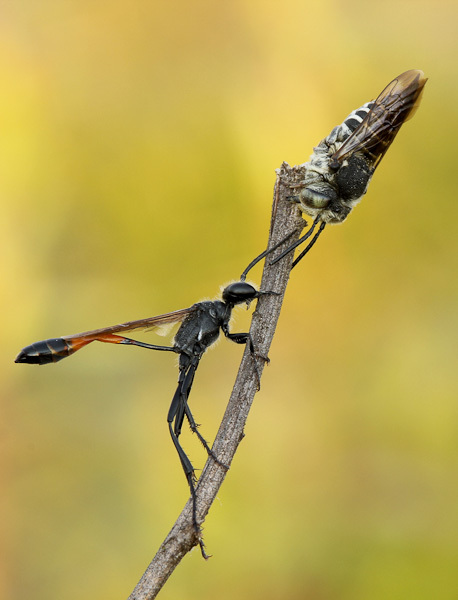 These wasps are so elegant! 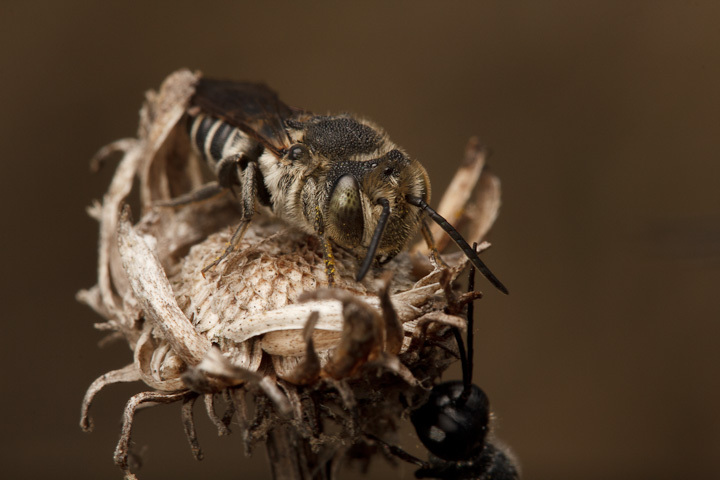 As usual, when I find a great subject, I try to frame some up in portrait orientation, just in case I get the call for a National Geographic cover! 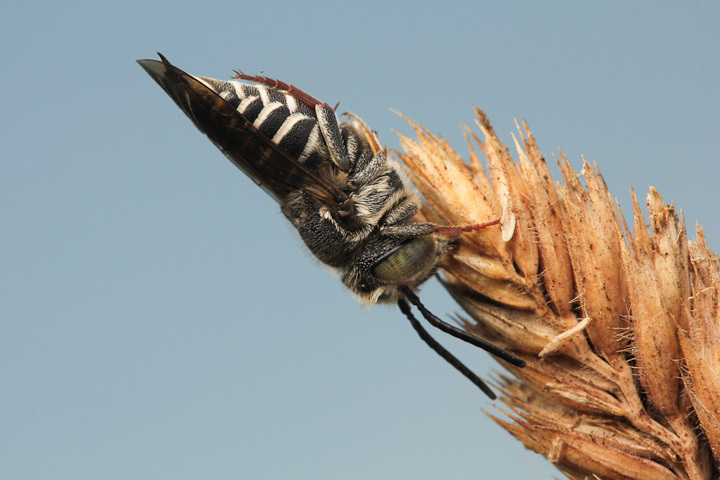 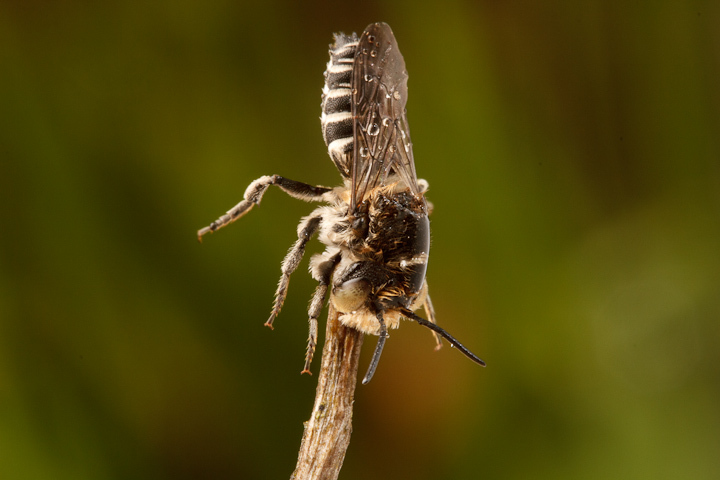 I am so excited to have met up with (on Saturday) my favourite little bees, Coelioxys! 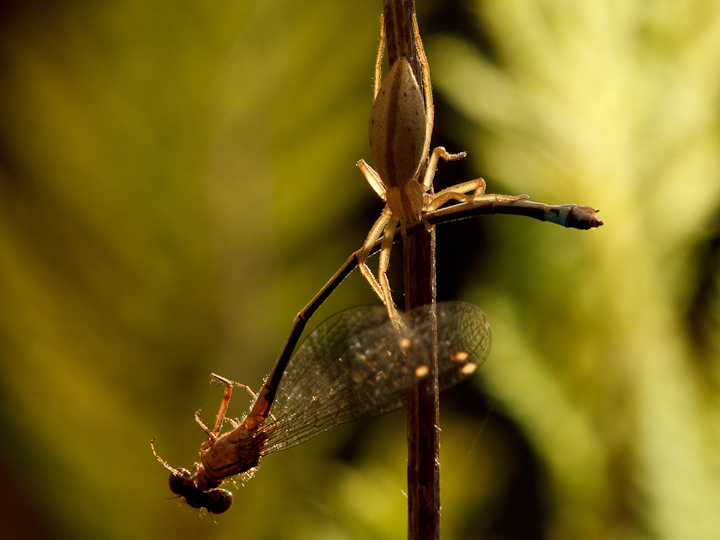 Something about these streamlined little wonders is just so appealing to me. 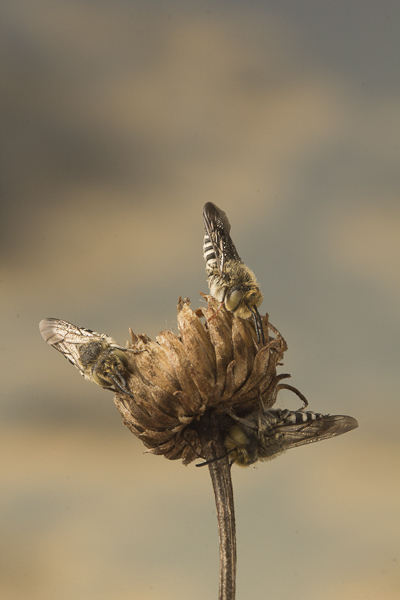 Of course, they were sleeping in their usual manner on the rainy morning, so I had good opportunities to play with the lighting. 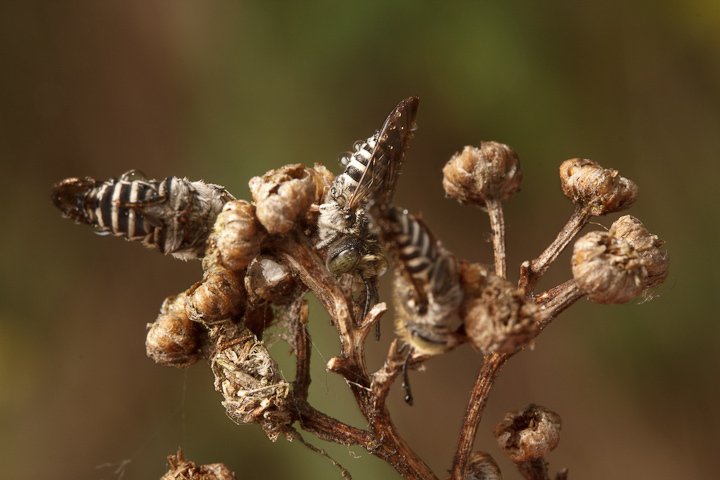 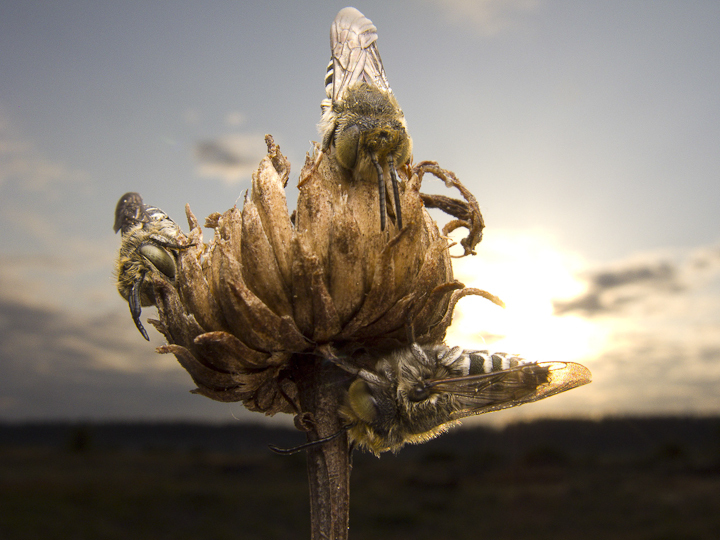 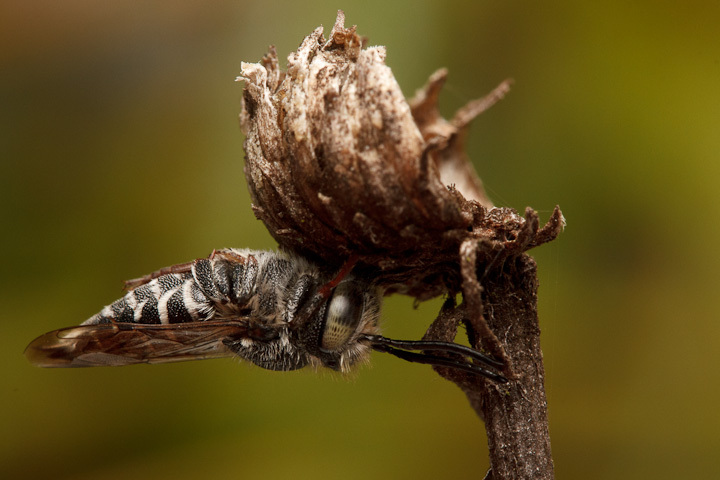 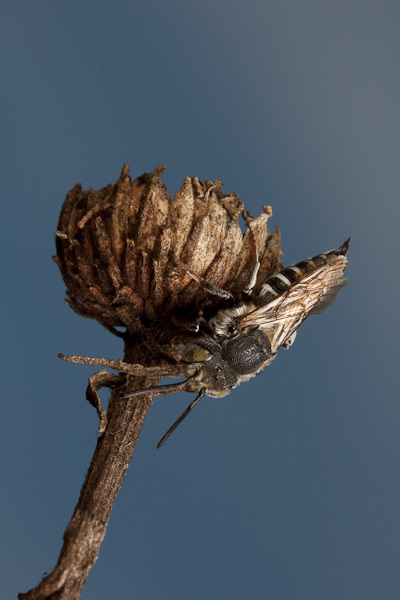 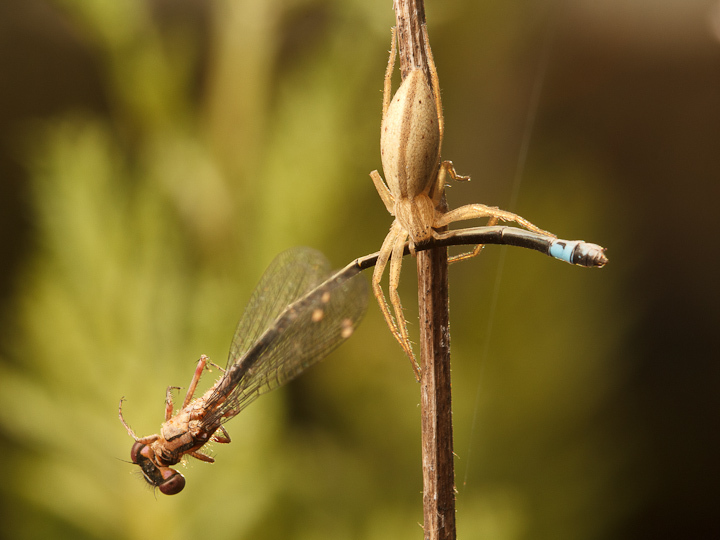 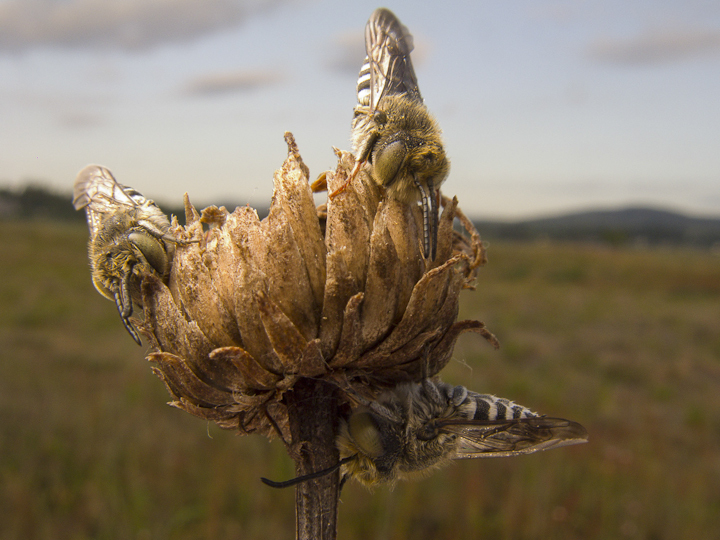 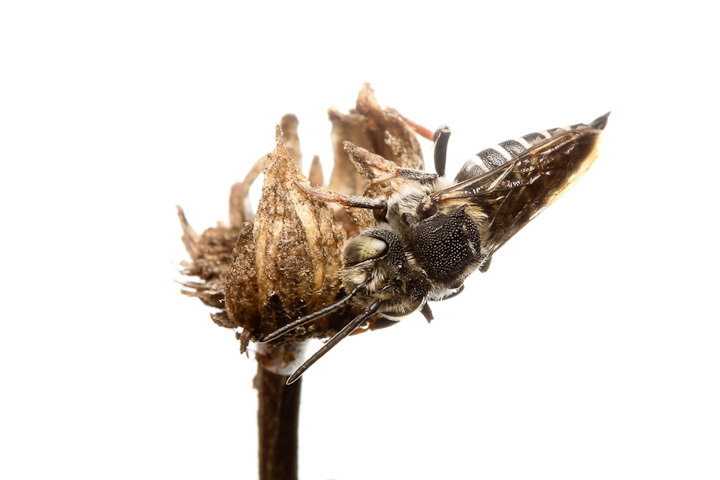 Here is what a cluster of Coelioxys looks like, on a dead flower stalk. 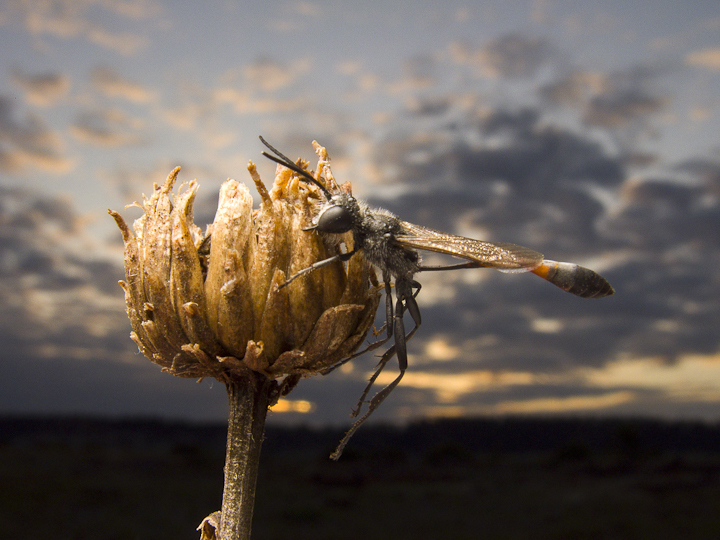 Because of the rain, this one had quite a bit of water accumulated. 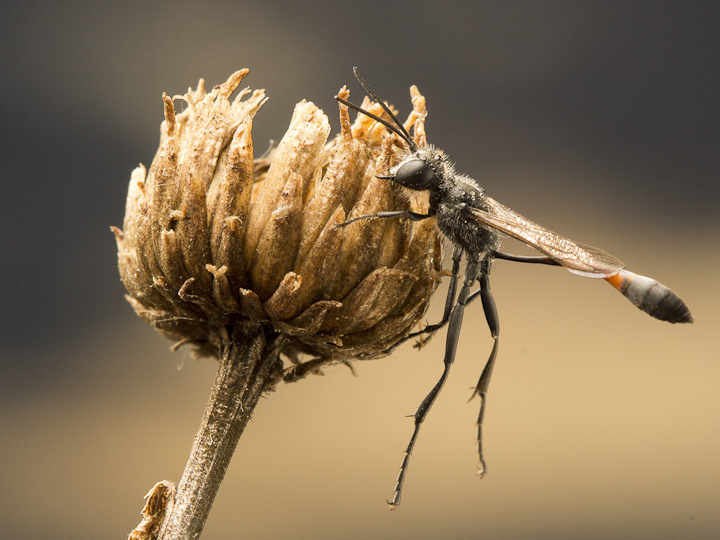 Like with the Ammophila yesterday, the water adds something to the already pretty texture. 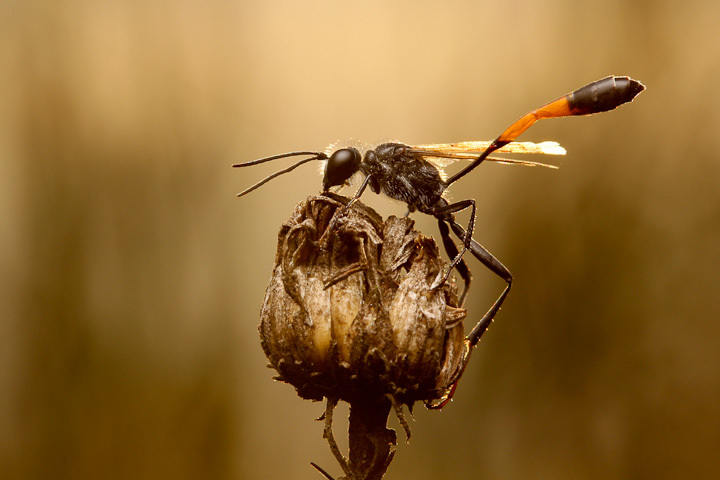 For this shot and the one at the top, I used some hard light from the rear and to the right to make these droplets shine. 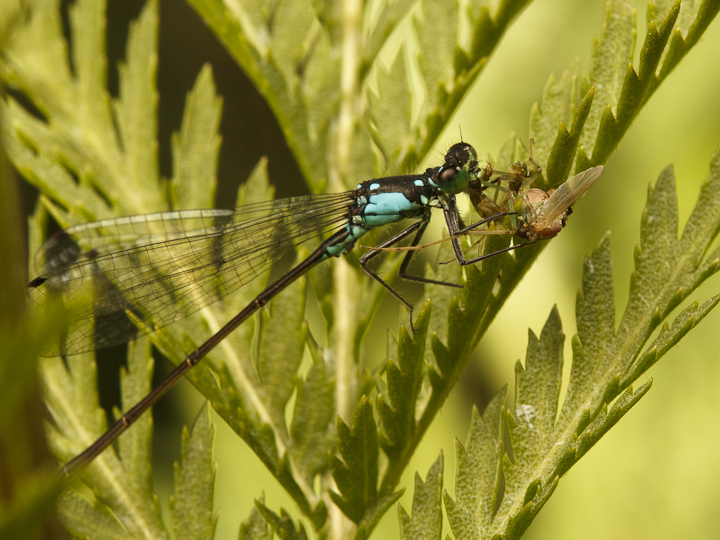 The green streak is a plant stem in the background. 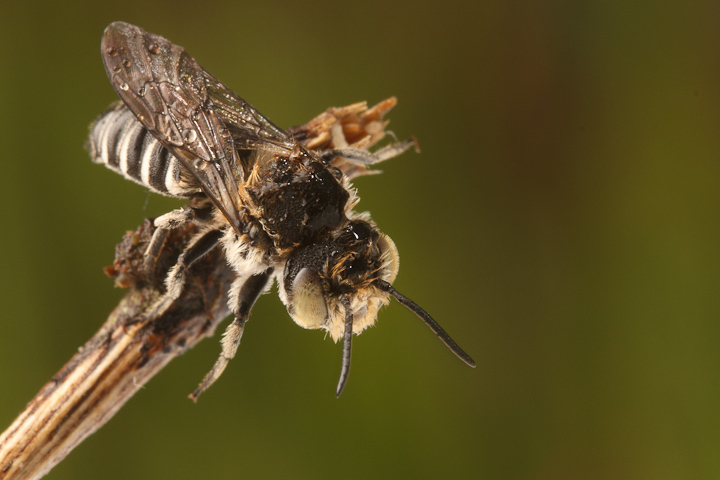 This bee is starting to wake, and grooming begins even before detaching her mandibles. 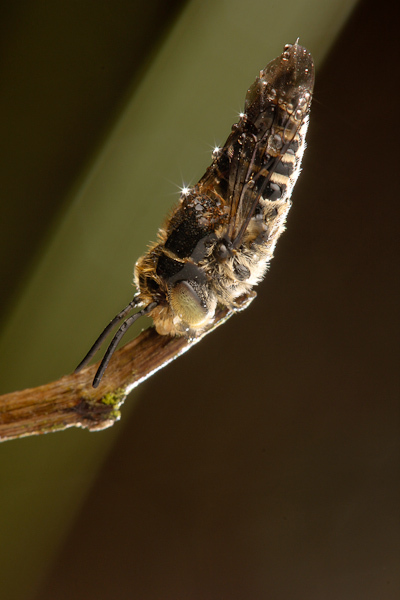 Now the bee is detached, and looking for a place to groom all this water off. 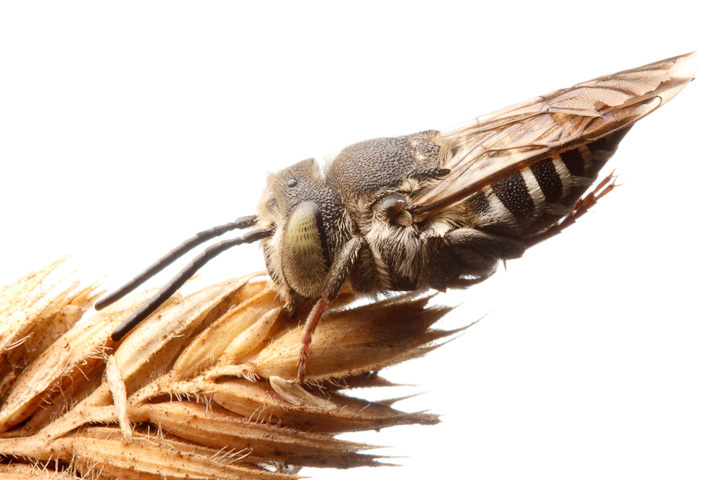 After a couple swipes with the feet, the thorax is drier. 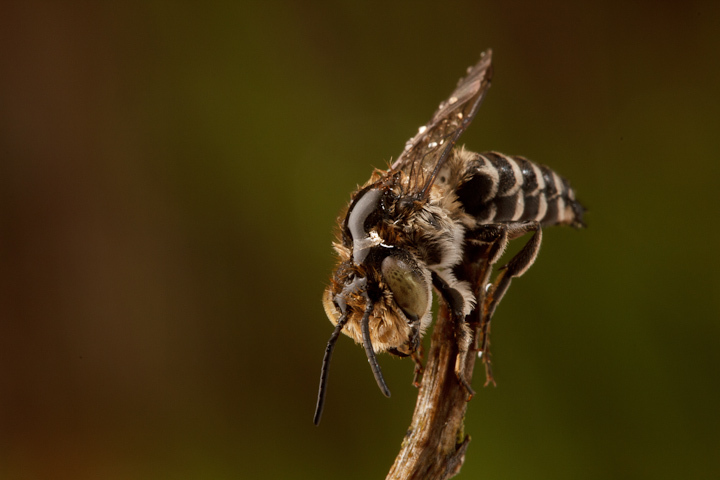 This pretty little bee had a bit of a drier perch for the night. 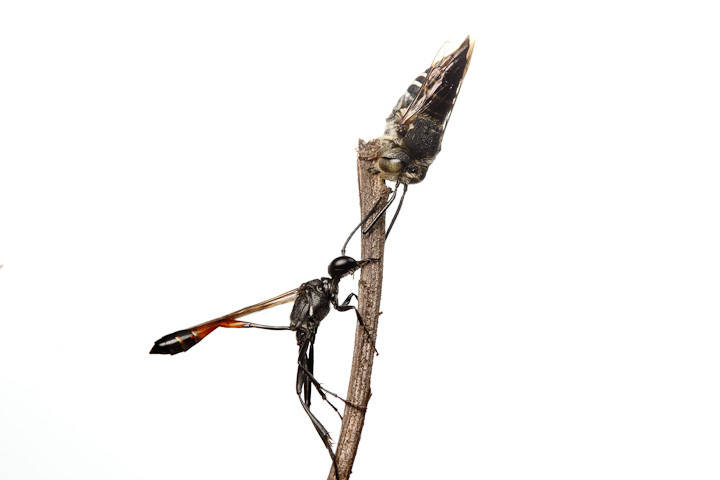 The past week has been rather hectic, with a flood forcing Catherine and I from our home, paper revisions made and further plans for Honduran fieldwork underway. 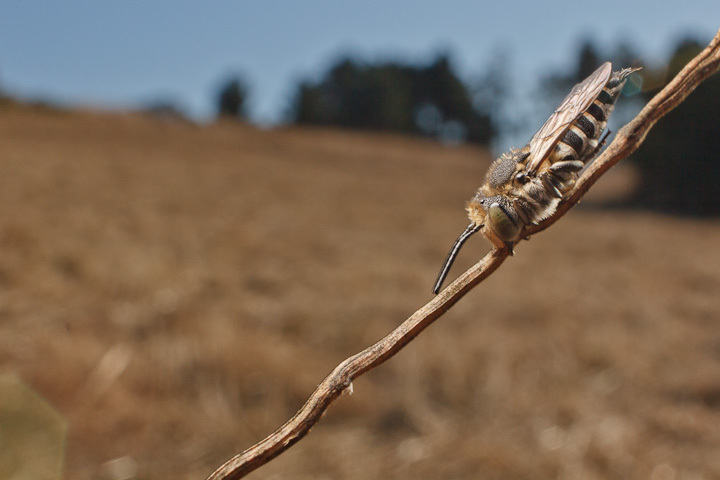 I did not get a chance to post these shots I took from our time on the Island, where I spent part of Sunday morning out shooting in the dry grasses of Beacon Hill Park. 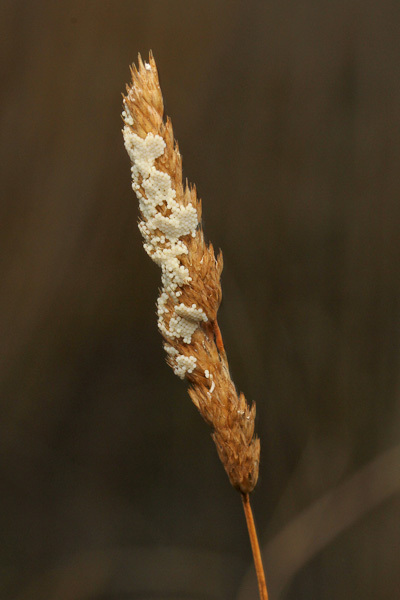 I saw lots of moth eggs on the dry grasses. 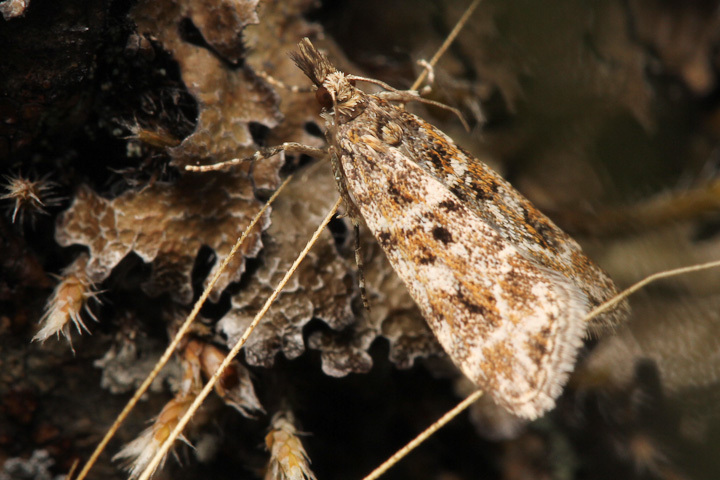 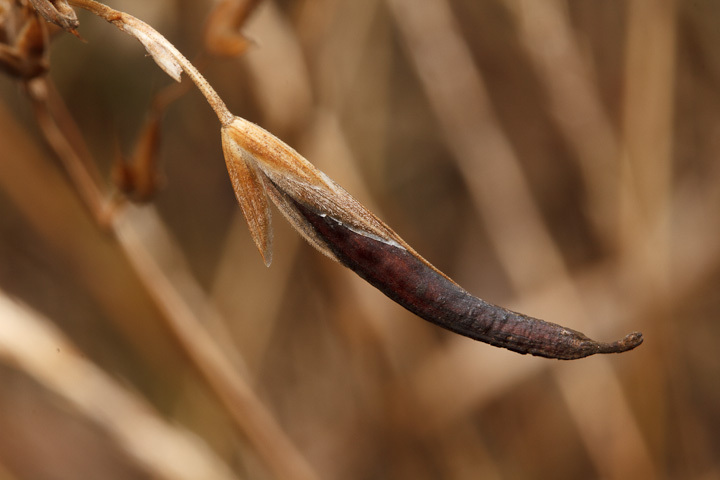 Now is the time to find sclerotia of ergot (Claviceps spp.) 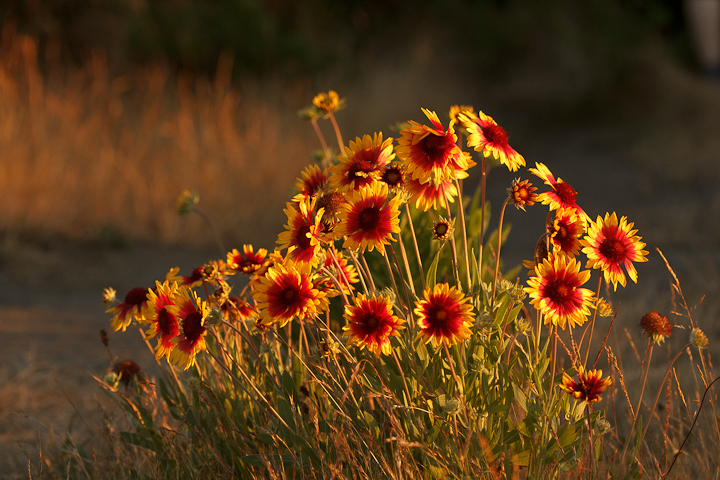 which contains chemicals studied by Albert Hofmann (from which he synthesized LSD-25). 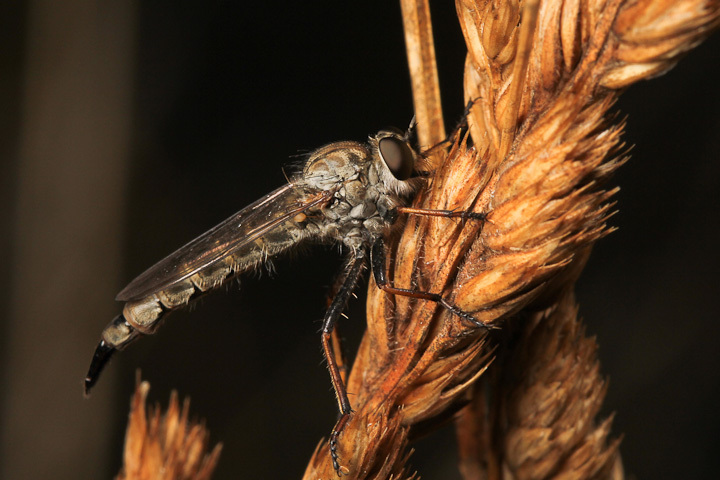 This sleepy robber fly was not as sleepy as I thought, and flew off after this shot. 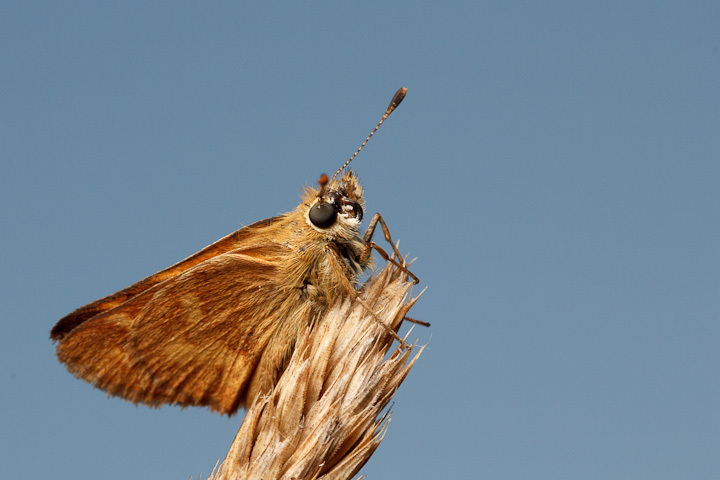 The skipper was more accommodating. 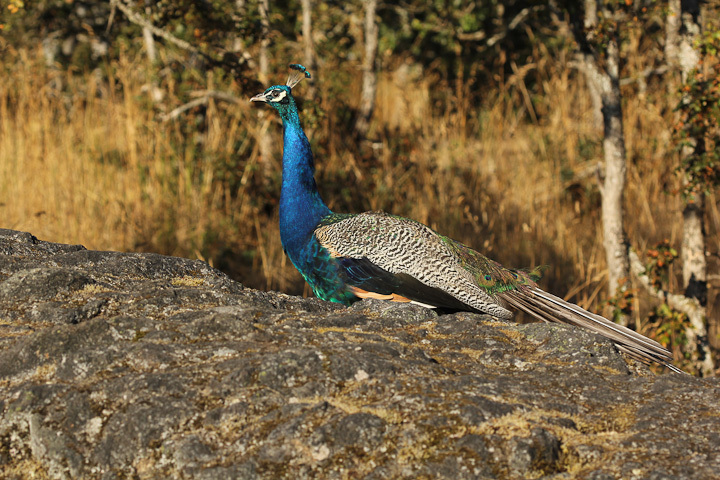 A peacock stalks the Garry Oak meadow. 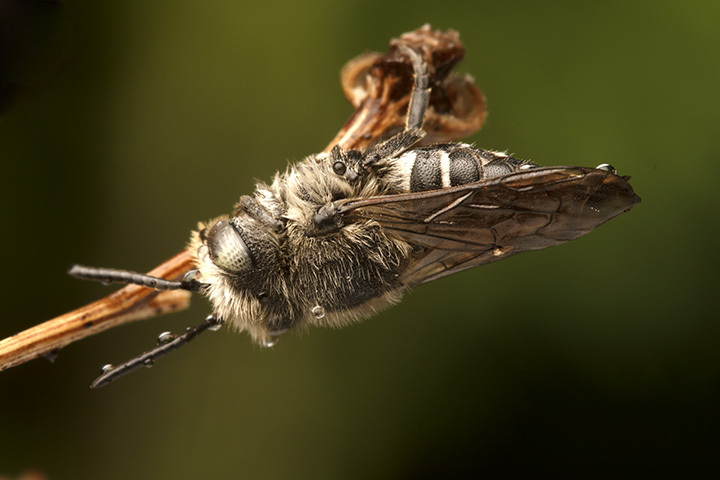 Coelioxys rufitarsus hanging from grass in the dawn light. 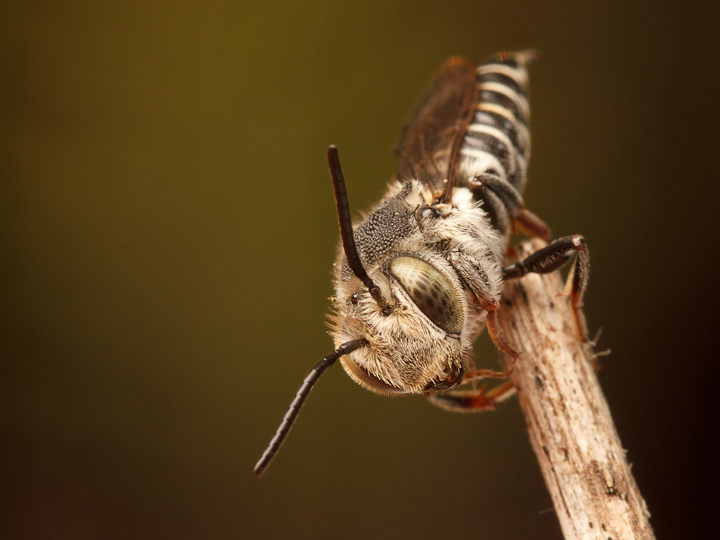 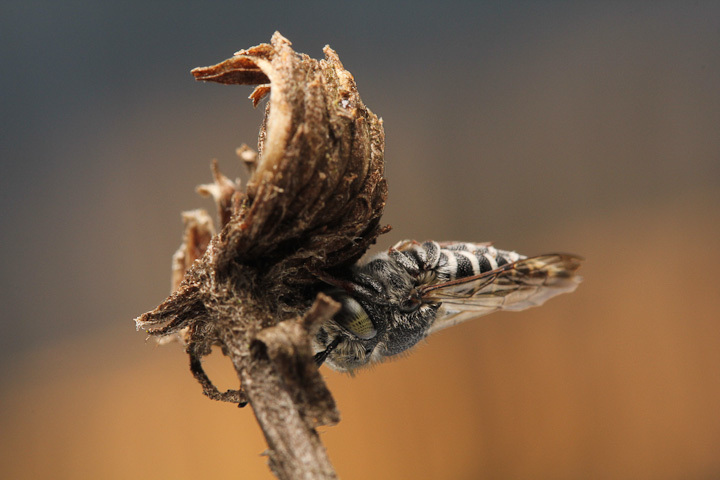 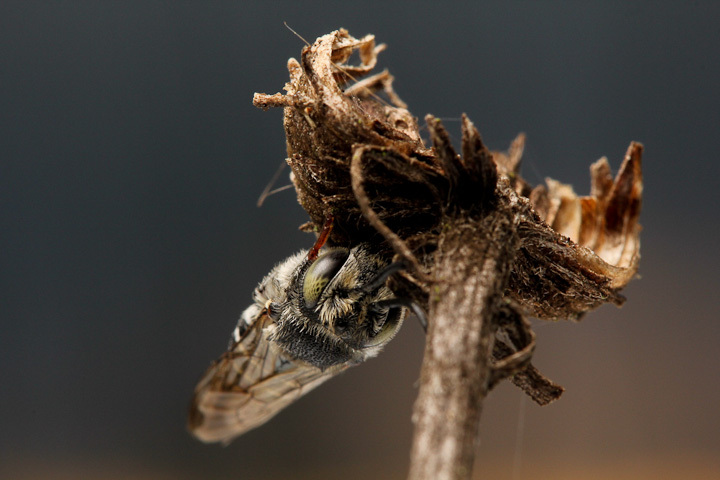 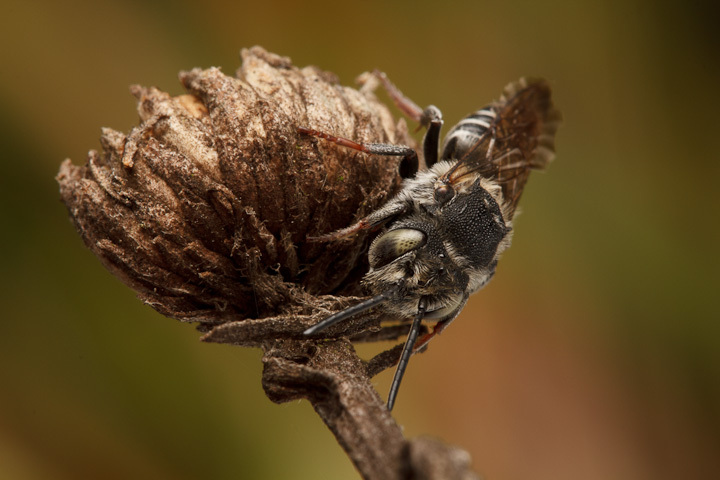 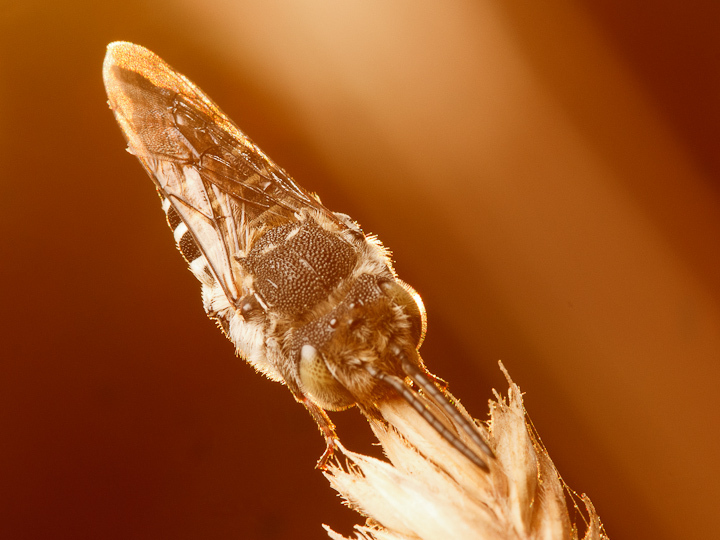 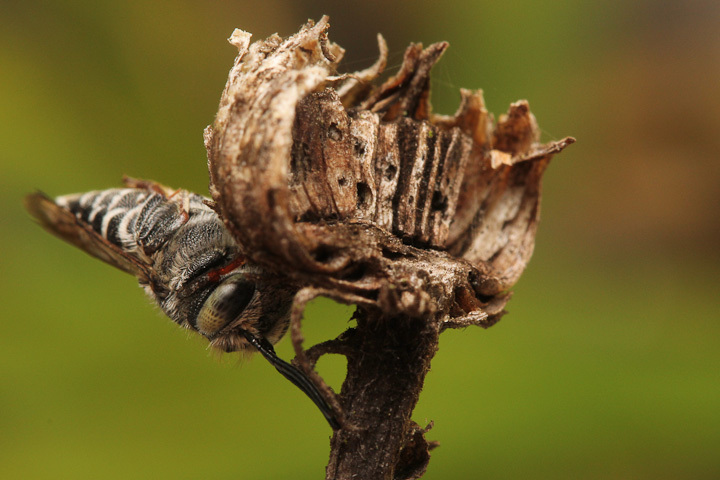 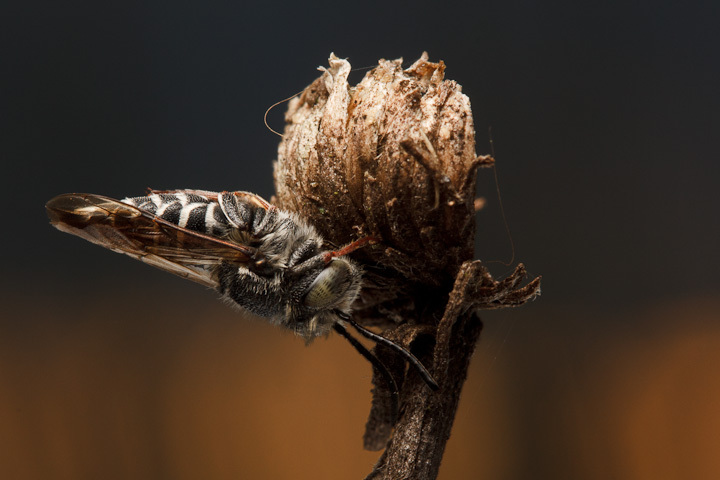 This entry was posted on September 5, 2013, in Uncategorized and tagged bees, Coelioxys, macro, morning, photography.